Need something different? Estex manufactures to your specifications. Please contact us to see what we can do for you. If you need an FAA Certified Repair Station to meet your ULD Door, Barrier, and Net repair needs, Estex can help! 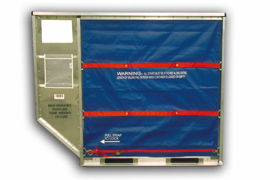 As FAA Certified Repair Station #E1KR915Y, we are authorized to provide you with airframe accessory repairs on fabric door covers, barriers, and nets associated with cargo and baggage carriers. Click Here for more information about Estex's qualifications to serve you.